Sen. Edward M. Kennedy underwent surgery Friday to repair a partially blocked artery in his neck, which was discovered during an examination of a decades-old back injury. Kennedy, 75, underwent the hourlong procedure on his left carotid artery - a major supplier of blood to the neck and head - at Massachusetts General Hospital, his office announced. The operation, performed by Dr. Richard Cambria, the hospital's chief of vascular surgery, was completed without complications, and the Massachusetts Democrat was expected to be released in several days, his Washington office said in a statement. A carotid endarterectomy, the formal name for the operation, is performed on more than 180,000 people a year to prevent a stroke. "As part of a routine evaluation of Senator Kennedy's back and spine, MRI studies picked up an unrelated, asymptomatic blockage in the senator's left carotid artery," the statement said. 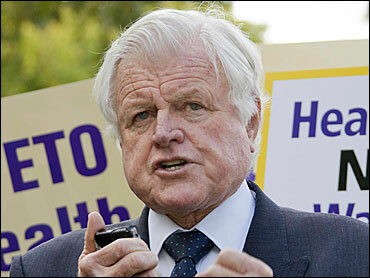 "This morning, Senator Kennedy underwent preventive surgery at Massachusetts General Hospital to remove the blockage." Kennedy is in relatively good health for his age, but he has been bothered by an aching back since a 1964 plane crash, which killed a pilot and one of Kennedy's aides. Then-Sen. Birch Bayh, D-Ind., who was traveling with Kennedy, pulled him from the wreckage but Kennedy suffered a back injury, punctured lung, broken ribs and internal bleeding. Because of the persistent pain, the senator often leans on a wall or sits on a stool when he otherwise would be expected to stand for an extended period. Kennedy had a back examination on Oct. 4, followed by an MRI exam at Cape Cod Hospital on Tuesday. That night, doctors told him of the arterial blockage. Kennedy campaigned Wednesday in the Merrimack Valley for Niki Tsongas, a Democrat seeking the 5th Congressional District seat in a special election next week, before heading to Massachusetts General for additional tests. Kennedy is the lone surviving son in his storied political family. His eldest brother, Joseph, was killed in a World War II airplane crash; President John F. Kennedy was assassinated in 1963 and Robert was assassinated in 1968. Kennedy, considered a liberal lion in the Senate, was re-elected in 2006. His term ends in 2013. The senator made a failed run for the presidency in 1980.